Happiness is a Bundle of Clothing - Planet Aid, Inc.
As you load your bags of clothing into a yellow Planet Aid bin and release the chute handle with a loud clang, you may wonder, "what happens next?" Yes you saved your clothing from the landfill, reducing your carbon footprint and helping the environment, but where will your clothing go and to whom? The answer to this question may surprise you. While Planet Aid may locally distribute some of the clothing we collect, the vast majority of the clothing is sold on the international market. In a guest piece for the New York Times, writer Zahara Bolouri described the excitement and activity that surrounds the arrival of used clothing in far off Mozambique. His essay "Happiness is a Bundle of Used Clothes" paints a vivid picture of how villagers respond to a shipment. Bolouri's essay is as true today as it was when published in 2010. It shows us how the simple, almost seemingly insignificant act of dropping an article of clothing into a recycling bin creates a ripple effect that travels all around the globe. So the next time you drop off your clothing and hear that loud clang as you release the bin chute, remember that your donation will create a stir of excitement when it is received in a far away land. It will bring a moment of cheer to a place where hardships are many and luxuries few. The shoes your child outgrew may thus become the prize possession of a child on her first day of school, or your old T-shirt may help shield a farmer from the intense tropical sun. From Belize to Botswana and every developing country in between, there is enormous demand for used clothing, which is sold in colorful secondhand street markets. 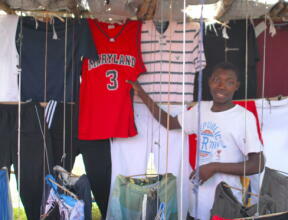 Watch and listen to local merchants talk about selling used footwear in Ghana.